Ever wondered how you can increase your search engine organic rankings and allow more consumers to find you? Search Engine Optimization is the go-to solution! It is a treasure waiting to be tapped into. Search Engine Optimization (SEO) in short is a framework of guidelines that help you streamline your business to reach the target audience. SEO allows you to understand the environment of the web and use keyworks to optimize your digital presence. The technical jargon can catch you off-guard and that’s where we come in. We take care of all your SEO related needs. THE TOP 5 SEARCHES GET 75% OF THE CLICKS. SO WHAT ARE YOU WAITING FOR? Just like we have examinations to test our learning, a website audit is an examination of the website to check the page’s performance prior to the implementing of SEO mechanisms or website redesign. Auditing your website will allow us to learn the strength and weaknesses of your website and will further allow us to work on them to create an ideal and target traffic on your page. Link building, simply put, is the process of getting other websites to link back to your website. All marketers and business owners should be interested in building links to drive referral traffic and increase their site’s authority. This not only increases traffic on your page but also enhances user engagement and reliability of your products and services. On-site SEO is constituted by the main element of content optimization. 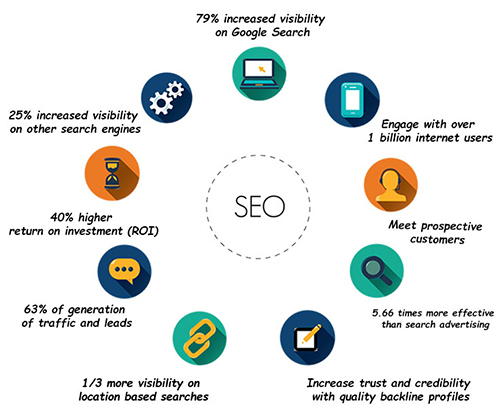 It is imperative to create and publish unique and innovative content on the lines of the market research data so as to use SEO to your advantage. Leave it up to us to come up with the right content and attract consumers through content development and promotion. We are always told, “keep your friends close but your enemies closer,” so we do just that. We analyze how your competitor works so that you don’t fall behind on engaging techniques that will prove beneficial for your business. This helps you stay at the top of your market. Our job does not end with optimizing your website or application, we go a step ahead and tap into the resources that arise from implementing SEO mechanisms. We provide you with regular reports and analysis based on your engagement so as to keep you in the loop. We care for your business too!